This Wiki resource is a business case aimed at convincing NHS management to allocate further resources for community based pulmonary rehabilitation programmes for individuals with chronic obstructive pulmonary disease (COPD). COPD is a chronic condition which can drastically alter a patient’s wellbeing and currently costs the NHS £1 billion annually. We believe that by implementing community based pulmonary rehabilitation programmes there will be increases in patients’ quality of life in addition to substantial long-term savings within the NHS. This is further detailed throughout the business case. 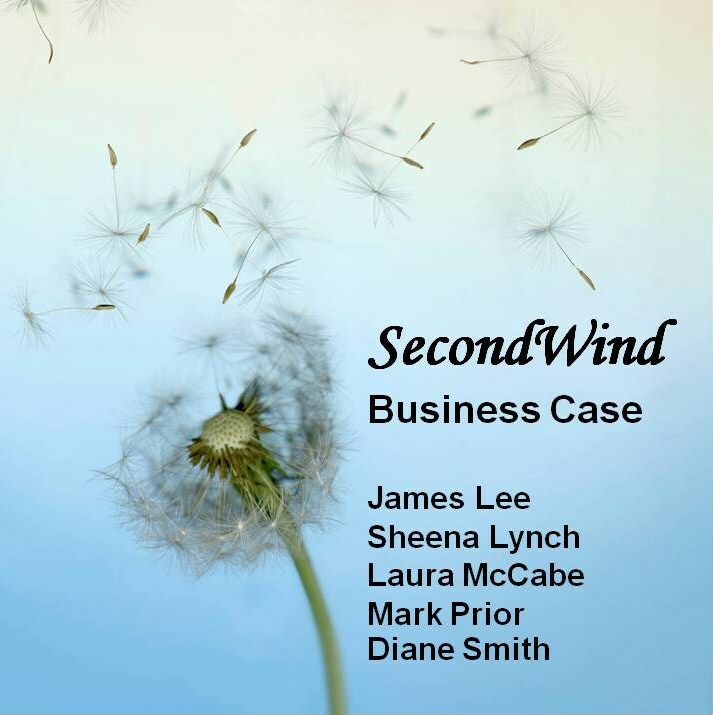 This business case plans to propose SecondWind, a pulmonary rehabilitation class for patients with Chronic Obstructive Pulmonary Disease (COPD). We are proposing that SecondWind runs twice weekly in a sports centre such as Edinburgh Leisure Meadowbank Complex. It will have a unique top-up component allowing participants to return if they feel as though they require further assistance in order to ensure adherence to exercise. This is essential in our programme as it is important for participants with COPD to add regular exercise into their lifestyle to maximise the benefits offered by pulmonary rehabilitation. COPD is a long-term condition, which is becoming more prevalent in the UK. Currently, the NHS is spending £1 billion annually on COPD. The prevalence of COPD is largely influenced by age therefore, in conjunction with the current trend of an aging population it is probable to see a parallel rise in the cost of COPD to the NHS. Due to the economic downturn and future spending freeze expected to occur in the NHS, there is a need for efficient utilisation of current resources. SecondWind will allow for the cost effective treatment of multiple participants in an accessible setting which is likely increase uptake and adherence of pulmonary rehabilitation. Along with the direct benefits participants will receive, there will be long-term savings within the NHS. This will occur due to decreased exacerbations, readmissions as well as reduced GP and practice nurse visits. It is projected that starting up costs will be £2,127.61 with a yearly cost per participant of £449.86. To evaluate the effectiveness of the program, we propose to explore validated outcome measure to address patient improvements and health care utilisation costs. Our mission is to provide a safe, cost effective and patient centered pulmonary rehabilitation programme in the community for individuals with COPD. SecondWind will provide an evidence base programme delivered by qualified and experienced cardiorespiratory staff. We plan on offering an exclusive top-up programme to help ensure adherence to long-term lifestyle changes. SecondWind will not only provide crucial benefits for participants but it will also decrease the financial demands of COPD on the already restricted NHS budget. Chronic obstructive pulmonary disease (COPD) describes a number of conditions including chronic bronchitis and emphysema, where people have difficulty breathing due to long-term damage to their lungs. Individuals with COPD will often have a mixture of both chronic bronchitis and emphysema. COPD leads to permanent damaged airways, which causes them to become narrower making it difficult for air to go into and out of lungs . Chronic bronchitis is defined as inflammation of the bronchi, which increases muscus production in airways and, thus, causes obstruction. Emphysema involves the alveoli losing their elasticity and support which causes them to narrow and trap air in lungs during expiration. This also causes problems with oxygen delivery, which may result in increased work of breathing and shortness of breath. The pathophysiological changes that occur to the lungs depends on the nature of the patients disease . Common symptoms of COPD are: cough, sputum production, shortness of breath, fatigue and decreased exercise tolerance . Pulmonary rehabilitation is an exercise programme combined with educational information. It can increase an individual’s exercise capacity, mobility and self-confidence leading to an increased quality of life . Exercise has been shown to improve quality of life, control symptoms and decrease exacerbations and hospital re-admissions . A top-up component has been included in the SecondWind programme, whereby participants can return to the class for a shortened period of time if they need further motivation or assistance. This has been included as a unique feature of our class to help improve uptake and adherence to exercise. Pulmonary rehabilitation based in a community sports facility may increase adherence, as it may be more accessible and individuals may feel less anxious about a class held in a community setting as opposed to a hospital. May have a reduced income due to the patient’s inability to work (loss of productivity) . Stahl et al. determined that health related quality of life (HRQL) in COPD deteriorates in parallel with lung function impairment; HRQL decreases with increasing severity of the disease. They also found that HRQL deteriorates with increasing age. COPD is the 5th largest killer in the UK. It is the 2nd most common cause of emergency admission to hospital and it is the most costly inpatient condition treated by the NHS . An estimated 3 million people have COPD in the UK although approximately 2 million of this estimation remain undiagnosed . COPD affects more men than women, although rates of women with COPD are climbing . The rate of COPD in the population is estimated at between 2% and 4% and the diagnosed prevelance of COPD in England alone is 1.6%. 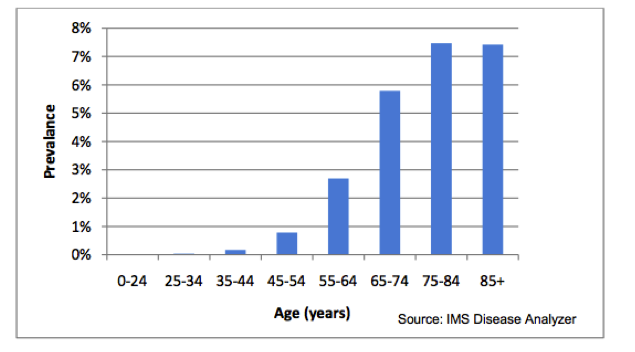 The prevalence of COPD is largely influenced by age. The diagnosed prevelance for individuals aged 45-54 is < 1% which increases to > 5% for individuals aged 65+ . This is depicted in Figure 1. The mortality rate of COPD in the UK is estimated at 23,000 people per year. In the UK the NHS is currently spends approximately £1 billion annually on COPD. It costs nearly 10 times more to treat severe COPD than the mild disease . There are currently many guidelines and initiatives for COPD; NICE guidelines , British Thoracic Society guidelines , GOLD: global initiative for COPD , NHS improvement . All of these guidelines discuss the importance of smoking cessation and pulmonary rehabilitation. There is currently an NHS stop smoking service available in Lothian that offers one-to-one support. Hospital based pulmonary rehabilitation programmes are also available throughout the UK. The evidence therefore suggests there are numerous clinical benefits associated with pulmonary rehabilitation . “The opportunity for structured, on-going exercise with peer and professional support, in a suitable venue, is perceived as important to people with COPD in facilitating a physically active lifestyle following pulmonary rehabilitation” . Improves cost-effectiveness in terms of cost per quality of life-adjusted year (QALY) gained versus conventional treatment. Ries et al. reported that pulmonary rehabilitation brings about improvements in health-related quality of life and functional and maximal exercise capacity. In addition, they also report that it has a positive impact on dyspnoea, which, as previously mentioned, is a common problem for individuals with COPD . British Thoracic Society Standards of Care Subcommittee on Pulmonary Rehabilitation  also support the finding that pulmonary rehabilitation reduces dyspnoea. Although there is mixed findings in regards to the effect of pulmonary rehabilitation, trends in study findings suggest that it reduces total hospitalisations  and significantly improved number of days in hospital . It has also been shown that, when compared to traditional COPD treatment, pulmonary rehabilitation showed improved cost-effectiveness in terms of cost per quality of life-adjusted year (QALY) gained. This is an important measure in this population as quality of life has been shown to decrease with COPD . In addition, NICE states that participation in pulmonary rehabilitation has a greater effect than use of bronchodilators in people with COPD . According to Crawford & Emmerson , real public spending* on the NHS has increased faster than economy-wide inflation since the 1950s – from 3.5% of the national income in fiscal year 1949-1950 to 7.9% in fiscal year 2007-2008, prior to the financial crisis and subsequent recession. * Spending which has been adjusted for the effect of the general level of inflation in the economy. The fastest rate of average growth on record was 6.4% per annum between fiscal years 1996-1997 and 2009-2010. In the 2010 Spending Review, the UK government committed to protecting NHS funding for that year to ensure adequate healthcare delivery to UK citizens. However, a freeze for NHS spending has been planned for fiscal years 2011-2012 to 2014-2015. If implemented, it will be the tightest 4-year funding period on record for the past 50 years . For spending on public services to increase total public spending must increase proportionate to national income over the same period. As can be seen from the above, changes to NHS and other public service funding are highly dependent on the actual economic climate of a given period – if average growth dips below forecasts, the amount available for public spending will be even lower . In Scotland, the current spending review and latest draft budget includes plans to freeze real NHS spending between fiscal years 2012 to 2015, as can be seen from Figure 3 . According to a report to the Holyrood health committee by Dr Andrew Walker of the University of Glasgow, NHS boards across Scotland have been directed to ensure 3% efficiency savings in fiscal year 2012-2013. Greater Glasgow and Clyde region leads the pack at a savings target of £58 million, with Lothian coming second at £27 million. Scottish Labour alleges that funding cuts have targeted mostly frontline staff, with more than 4500 NHS jobs cut since 2009, of which 2000 were nurses . COPD is a major contributor to healthcare costs UK-wide. It has been estimated that the number of COPD sufferers in the UK ranges between 900,000 to 3 million . In 2003, the UK segment of the Confronting COPD survey estimated that the average annual direct costs per patient to the healthcare system came to £819.42, while average indirect costs to society such as paid sick leave, lost productivity and additional burden of care came to £819.66. UK-wide, 24 million lost working days, amounting to 9% of all certified sick leave, are attributable to COPD – nearly 20 times that of asthma.. 24% of all COPD patients were completely unable to work due to the disease, while 9% were limited in their ability to work and 5% had to miss work because of the disease. Furthermore More than 44% of COPD patients in the UK were found to be below retirement age. This figures illustrate the significant impact COPD has on the national economy . 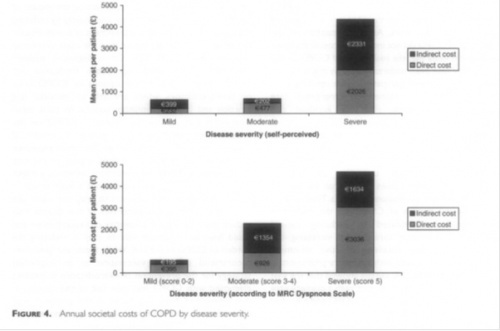 As can be seen from Figure 4, the later stages of COPD cause an across-the-board increase in direct and indirect costs, the former being attributable mostly to hospitalisation. There has been a increase in prevalence in COPD of 25% in males and 69% in females from 1990 to 1997 , if this trend continues in the future or prevalence remains the same with an increasing population, the burden of COPD on the healthcare system will only increase, particularly as the population ages, allowing COPD to progress to its later and more care-intensive stages which has a greater cost to the NHS. According to Audit Scotland’s 2007 report , there are roughly 100,000 known cases of COPD in Scotland as of 2005, with a 33% increase in prevalence predicted for the next 20 years. 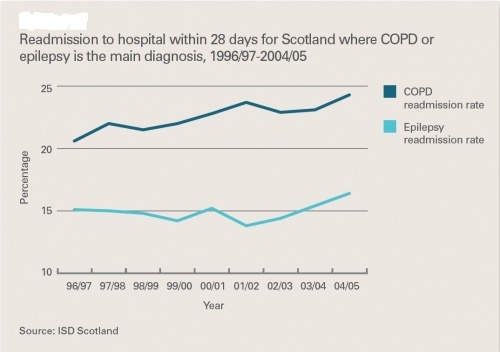 COPD is the 3rd most common reason for hospital admission in Scotland, with 19% of patients readmitted more than once and 16% at least twice more, observed from 2003-2004 . As of the end of 2010, the number of known cases in Scotland appears to have held remained relatively stable, ending the year at 89,170 documented cases . 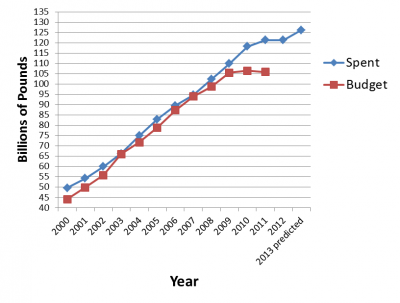 COPD-related healthcare utilisation showed a definite rise from 2007 2010 as illustrated by figure 5 . COPD’s direct per-annum cost to NHS Scotland is estimated at £100 million. inpatient stays have shown a steady downward trend, however, readmission rates have been rising over the same period, as seen in Figure 6 . Based on the national average expense of £1036 per paitent per year it suggest that most known patients in Scotland have moderate- severe COPD. This cost suggests that there is evidence for pulmonary rehabilitation to potentially generate large indirect savings by decreasing readmission rates, thus, freeing up hospital beds . Cost-effectiveness in terms of cost per quality of life-adjusted year (QALY) gained versus conventional treatment. It was also recommended that referral to pulmonary rehabilitation be considered at all stages of disease progression; as soon as symptoms are present and not at predetermined impairment levels. Additionally, it was noted that patients previously hospitalised for acute COPD exacerbation showed a tendency towards significant benefits from early pulmonary rehabilitation (within 1 month post-discharge), compared to patients receiving standard care modalities or no rehabilitation during this period. Evidential quality was low in the systematic review examined, but it was determined that there was no reason why patients who had a recent COPD exacerbation should not be considered for pulmonary rehabilitation . The NHS Lothian COPD Guidelines  concur broadly with the NICE 2010 Guidelines , agreeing that there is sufficient evidence that it is evidentially sound in its purported benefits to all COPD patients, and particularly those with severe to extremely severe COPD, or those scoring ≥ 3 on the Medical Research Council (MRC) breathlessness scale. Given that pulmonary rehabilitation is available in all Community Health Partnerships (CHPs) throughout Lothian, this guideline recommends that all patients with repeated exacerbations or who are hospitalised for exacerbations be fast-tracked for pulmonary rehabilitation . It acknowledges both the benefits of pulmonary rehabilitation on COPD patients with regard to improving health-related quality of life, exercise capacity and breathlessness, particularly in the wake of acute exacerbation. Pulmomary rehabilitation is a method of doing so in a safe, timely and cost-effective manner . The following are patients’ accounts of what life was like before starting a pulmonary rehabilitation programme for COPD, called Breath Smart, and how the rehabilitation classes have affected them. We feel that the improvements they report to their quality of life is another reason for why we should have more pulmonary rehabilitation classes. They have all given written consent for their stories and/or name and/or video to be shared on physiopedia. Patient A’s Story: Back before I started at Breath Smart I couldn’t do a lot. I was heavily dependent on oxygen and practically house bound. I couldn’t use the stairs or do my gardening or go to the shops. I was actually wheeled into my 1st class at breath smart because I couldn’t walk far at all. I must have been in hospital 8 or 9 times the year before I started these classes. I’ve been coming twice a week for just over a year and now I don’t use any oxygen at all and I will gladly take the stairs without any trouble. I haven’t been admitted to hospital once this year. I can now use the treadmill for 25mins at a time at a speed of 5.5km/hr and an incline of 3.5. I never thought this would be possible. Breath Smart has given me back my freedom I can’t begin to explain the changes it has made to my life. I am however still smoking. If I was able to improve this much while still smoking I can only imagine how much better I would be if I could give them up but I haven’t been able to as of yet. Anne’s Story: Before starting Breath Smart I spent a lot of time in hospital, my breathing was very bad and my general health was very bad also. I used an awful lot of oxygen. Confidence was a big problem. It was hard to know what to do, that was very very difficult. I had been very very active all my life and then everything came to a standstill. My consultant suggested I come to Breath Smart. I’m here 2 years now, and the difference in my life is huge! I couldn’t even start to tell people how much of a difference it has made to my life, but I do tell people. My family have all seen the difference it has made to my life. I’m more active. Coming to breath smart gives you an incentive, it gives you the confidence, the people here are professional you trust them, I trust everyone here they are very very good, they explain to you and tell you if you are doing too much or doing too little. This is the 1st year that I haven’t been in hospital since I was diagnosed. In order to establish the most effective setting for our pulmonary rehabilitation programme we evaluated hospital, community and home settings using existing evidence. Choosing the right setting for the pulmonary rehabilitation programme is vital for ensuring the success of the programme. The correct setting can have a positive effect on patient uptake and adherence positively influencing the health of COPD patients reducing exacerbations and hospital admissions and in turn reduce NHS spending on treating COPD. A recent survey highlighted that pulmonary rehabilitation is only available in 25% of U.K. hospitals  limiting the number of COPD patients that can benefit. There are a variety of settings in which pulmonary rehabilitation services for patients with COPD can be provided. Traditionally services were based in hospital inpatient and outpatient settings, but there is growing interest in developing services in community and home settings making it easier for patients to attend and carry out. As pulmonary rehabilitation programmes have been long established in hospital based settings it is the standard comparison for any other potential pulmonary rehabilitation programme settings. Location is stated as a core element in the full clinical guideline on COPD, it states that for pulmonary rehabilitation programmes to be effective and to improve compliance, they should be held at times that suit participants, in buildings that are easy for participants to get to and have good access for people with disabilities . Patient may feel safer and more comfortable exercising in own home Information clear and well instructed? Patient understands and carries out correctly? Following a review of the evidence a community setting was chosen for the pulmonary rehabilitation programme. Evidence showed pulmonary rehabilitation provided in a community setting has comparable benefits to that produced in a more customary hospital-based setting, with both settings producing significant improvements in exercise capacity and quality of life  . The choice of venue has been found to be determined by local factors of convenience, current availability of resources and incremental costs as supported by Waterhouse et al. . When health economic analysis was considered by Waterhouse et al. it revealed that neither hospital nor community based programmes were preferential. Benefits of having the class in a community setting aided attendance and compliance helping not only patients but in the long run saving the NHS money by preventing exacerbations and reducing hospital admissions. Evidence suggests that there appears to be no clinical or cost benefit of community based pulmonary rehabilitation programmes over hospital based pulmonary rehabilitation and that the venue may be best determined by local access preferences and transport links reinforcing current NICE recommendations . Eligibility for the proposed pulmonary rehabilitation program shall be in line the NICE COPD guideline . This states that “pulmonary rehabilitation should be offered to all patients who feel functionally disabled by COPD” . According to General Practice Airways group's sharing of best practice meeting  and the American Thoracic Society/European Respiratory Society Statement on Pulmonary Rehabilitation , at least one supervised session is required per week for effective pulmonary rehabilitation. It has also been suggested that two supervised sessions per week may have a better impact on health-related quality of life compared to one supervised session .Group sessions would be interspersed with exercise sessions which participants would do in their own time at home or in a local leisure facility. It is suggested that a minimum of four home sessions are completed per week . Therfore, to make this program as cost effective as possible, we suggest that it should contain two weekly exercise classes, and two home sessions, as opposed to a number of individually supervised rehabilitation sessions which would be labour and cost intensive. As recommended by the American Thoracic Society/European Respiratory Society Statement on Pulmonary Rehabilitation , a minimum of twenty exercise sessions would be included in this pulmonary rehabilitation program at a frequency of at least three per week. According to the NICE COPD guideline , duration of initial pulmonary rehabilitation should be between six and 12 weeks. To conform to both of these guidelines, we propose a 10 week pulmonary rehabilitation program consisting of two supervised sessions per week. Although exercise of varied intensity has been shown to be beneficial for people with COPD, high intensity exercises would be encouraged in this rehabilitation program for greater physiological effects . In addition to the traditional lower limb training normally included in pulmonary rehabilitation, such as walking or cycling, upper limb exercises, such as arm ergometer or hand weight exercises, will be included as a number of beneficial effects have been noted including reduce ventilatory requirements while using the arms . In addition to the structured exercise class, an essential educational component will be included in the pulmonary rehabilitation program . This would include teaching participants the importance of exercise, which is of specific importance as many individuals with COPD elect not to take up a referral to pulmonary rehabilitation as they think they would not experience any health benefits. Ensuring good attendance at pulmonary rehabilitation requires consideration of how information regarding its proven benefits can be conveyed to participants . It is also important to supply the participants with information on how to transfer exercise into environments outside the class, such as their home, as this will be required for between supervised sessions and once they have completed the program . Information on relaxation, anxiety management, medication and self-management , including an action plan for exacerbations , would also be included as this seen as being essential in an effective pulmonary rehabilitation program. Below is a table indicating the fixed costs of the SecondWind class by year and by month. Physiotherapist = 21,000 + 2750= 22750, 22750 ÷ 1687 = 14.08. Below is a table indicating the variable costs of the SecondWind class by year and by month. Below is a table indicating the capital costs of the SecondWind class by year and by month. To analyse the risks of our class being sucessful or not we performed a SWOT analysis looking at our Strengths, Weaknesses, Opportunities and Threats. Being placed in the community may, potentially, cause less anxiety for participants than a hospital setting. The gym has more available space than most hospitals, thus, a greater capacity for participants. Since the rehabilitation program is not being run in the hospital, there is a lower chance of participants acquiring healthcare related infections. Our program will have qualified staff including first aiders who are trained in defibrillator use. The physiotherapist will have cardiorespiratory education as part of their degree and experience in respiratory care. They will be able to provide answers to questions patients may have. There is an increasing body of evidence that pulmonary rehabilitation decreases long term costs to NHS. 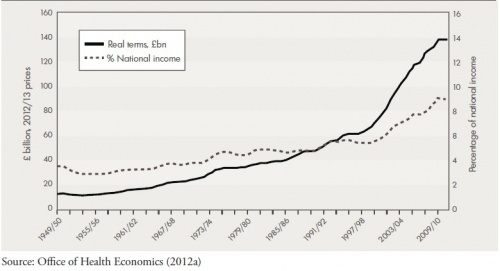 As Figure 7 and 8 demonstrate, the NHS, in real terms, is receiving less money. Therefore, projects like our proposed class would assist in maximising uitity for resources invested. The class are free for participants therefore, those effected by inablility to work do not have to worry about how they will pay for the class, this may encourage more participants to take part. Some participants may find a gym to initially be an intimidating setting. However, they will be provided with information explaining that they will be exercising with other people who are of a similar age and have the same condition. Exercise is an undesirable activity for some participants, especially in people with COPD where breathlessness may be an issue. However, they will be provided education on the benefits of exercise and what to expect from the classes. There is a large prevalence and incidence of COPD, as indicated by Figure 9, which provides a large pool of participants who may take part in our classes. Some gyms run pulmonary rehabilitation classes. However, these are 1 to 1 sessions with a gym instructor so there is a lack of peer and group support. In addition, this rehabilitation program will have all the material delivered by health professionals with experience in respiratory care. Pulmonary rehabilitation is also often held in the hospital. We feel that our program setting is less intimidating and carries fewer negative connotations. There is also the additional benefit of more car parking facilities than what is available at most hospitals. To address the issues sourrounding the health and safety risks we compiled a risk assessment form for the classes. Please refer to Appendix 6. Patient healthcare utilisation frequency: Changes in per-patient rate of consultations, hospitalisations, drug prescriptions and other use of healthcare will be indicative of any savings accrued by the NHS. This outcome will be assessed via a healthcare utilisation questionnaire administered at three intervals; prior to commencement of treatment, 6 months post-programme and 1 year post-programme. Quality of life questionnaire – See Appendix 4. These baseline measures will be used to individualise the participants exercise programmes. ↑ 1.0 1.1 1.2 1.3 1.4 1.5 1.6 NHS. Chronic Obstructive Pulmonary Disease 2012; Available at: http://www.nhs.uk/Conditions/Chronic-obstructive-pulmonary-disease/Pages/Introduction.aspx. Accessed October/18th, 2012. ↑ 2.0 2.1 British Lung Foundation. COPD. 2012; Available at: http://www.blf.org.uk/Conditions/Detail/COPD#overview. Accessed October/20th, 2012. ↑ 3.0 3.1 3.2 NHS Lothian. Lothian Pulmonary Rehabilitation Audit. 2009; Available at: http://www.lothianrespiratorymcn.scot.nhs.uk/wp-content/uploads/2010/08/Pulmonary-Rehabilitation-Service-Audit-2009-v1.0.pdf. Accessed October/20th, 2012. ↑ Willgoss T, Yohannes A, Goldbart J, Fatoye F. COPD and anxiety: its impact on patients' lives. Nurs Times 2011 Apr 19-May 2;107(15-16):16-19. ↑ Stahl E, Lindberg A, Jansson SA, Ronmark E, Svensson K, Andersson F, et al. Health-related quality of life is related to COPD disease severity. Health Qual Life Outcomes 2005 Sep 9;3:56. ↑ 6.0 6.1 6.2 6.3 National Clinical Guideline Centre. COPD Costing report: Implementing NICE guidelines 2011; Available at: http://www.nice.org.uk/nicemedia/live/13029/53292/53292.pdf. Accessed October/18th, 2012. ↑ Department of Health. Action plan for respiratory disease treatment published. 2012; Available at: http://www.dh.gov.uk/health/2012/05/nhs-companion-copd/. Accessed October/21st, 2012. ↑ 9.0 9.1 9.2 9.3 British Thoracic Society. Standards of Care Committee on Pulmonary Rehabilitation. Thorax 2001;56:827-834. ↑ Global Initiative For Chronic Obstructive Lung Disease. Global Strategy for the diagnosis, management, and prevention of Chronic Obstructive Pulmonary Disease (Revised 2011). Global Initiative For Chronic Obstructive Lung Disease 2011:1-80. ↑ 11.0 11.1 Hogg L, Grant A, Garrod R, Fiddler H. People with COPD perceive ongoing, structured and socially supportive exercise opportunities to be important for maintaining an active lifestyle following pulmonary rehabilitation: a qualitative study. Journal of Physiotherapy 2012 9;58(3):189-195. ↑ 12.0 12.1 Ries AL, Bauldoff GS, Carlin BW, Casaburi R, Emery CF, Mahler DA, et al. Pulmonary Rehabilitation: Joint ACCP/AACVPR Evidence-Based Clinical Practice Guidelines. Chest 2007 May;131(5 Suppl):4S-42S. ↑ Griffiths TL, Burr ML, Campbell IA, Lewis-Jenkins V, Mullins J, Shiels K, et al. Results at 1 year of outpatient multidisciplinary pulmonary rehabilitation: a randomised controlled trial. Lancet 2000 Jan 29;355(9201):362-368. ↑ Griffiths TL, Phillips CJ, Davies S, Burr ML, Campbell IA. Cost effectiveness of an outpatient multidisciplinary pulmonary rehabilitation programme. Thorax 2001 October 01;56(10):779-784. ↑ 15.0 15.1 15.2 15.3 Crawford R, Emmerson C. NHS and social care funding: the outlook to 2021/22. Institute for Fiscal Studies 2012;July:1-32. ↑ 16.0 16.1 The Scottish Government. Scottish Spending Review 2011 and Draft Budget 2012-13. 2011; Available at: http://www.scotland.gov.uk/Resource/Doc/358356/0121130.pdf. Accessed November/16, 2012. ↑ BBC. Commmissioning Success. 2012; Available at: http://commissioningsuccess.com/2012/07/nhs-budget-squeeze-could-last-a-decade/. Accessed October/20th, 2012. ↑ Khdour MR, Agus AM, Kidney JC, Smyth BM, Elnay JC, Crealey GE. Cost-utility analysis of a pharmacy-led self-management programme for patients with COPD. Int J Clin Pharm 2011 Aug;33(4):665-673. ↑ 19.0 19.1 19.2 Britton M. The burden of COPD in the U.K.: results from the confronting COPD survey. Respir Med 2003 3;97, Supplement C(0):S71-S79. ↑ 20.0 20.1 20.2 20.3 20.4 Audit Scotland. Managing long-term conditions. 2007; Available at: http://www.audit-scotland.gov.uk/docs/health/2007/nr_070816_managing_long_term.pdf. Accessed October/15, 2012. ↑ 21.0 21.1 ISD Scotland. Estimated numbers of consultations, by staff type. 2011; Available at: http://www.isdscotland.org/Health-Topics/General-Practice/Publications/2011-11-29/PTI_Nov11_charts_consultations_COPD.xls. Accessed November/13th, 2012. ↑ 22.0 22.1 The Scottish Public Health Observatory. Chronic obstructive pulmonary disease (COPD): primary care data. 2012; Available at: http://www.scotpho.org.uk/health-wellbeing-and-disease/chronic-obstructive-pulmonary-disease-copd/data/primary-care-data. Accessed November/13th, 2012. ↑ 23.0 23.1 23.2 NHS Lothian. Chronic Obstructive Pulmonary Disease (COPD) Guideline. Lothian Respiratory (COPD) MCN 2011;August:1-18. ↑ 24.0 24.1 NHS Quality Improvement Scotland. Healthcare Improvement Scotland COPD services - Clinical Standards, Edinburgh. NHS Quality Improvement Scotland 2010. ↑ 25.0 25.1 25.2 Ward JA, Akers G, Ward DG, Pinnuck M, Williams S, Trott J, et al. Feasibility and effectiveness of a pulmonary rehabilitation programme in a community hospital setting. Br J Gen Pract 2002 Jul;52(480):539-542. ↑ 26.0 26.1 26.2 26.3 26.4 Waterhouse JC, Walters SJ, Oluboyede Y, Lawson RA. A randomised 2 x 2 trial of community versus hospital pulmonary rehabilitation, followed by telephone or conventional follow-up. Health Technol Assess 2010 Feb;14(6):i-v, vii-xi, 1-140. ↑ 27.0 27.1 27.2 Maltais F, Bourbeau J, Shapiro S, Lacasse Y, Perrault H, Baltzan M, et al. Effects of home-based pulmonary rehabilitation in patients with chronic obstructive pulmonary disease: a randomized trial. Ann Intern Med 2008 Dec 16;149(12):869-878. ↑ Slovic P, Finucane ML, Peters E, MacGregor DG. Risk as Analysis and Risk as Feelings: Some Thoughts about Affect, Reason, Risk, and Rationality. Risk Analysis 2004;24(2):311-322. ↑ 29.0 29.1 29.2 Guëll MR, Lucas P, Gáldiz JB, Montemayor T, González-Moro JMR, Gorostiza A, et al. Home vs hospital-based pulmonary rehabilitation for patients with chronic obstructive pulmonary disease: A Spanish multicenter trial. Archive Bronconeumol 2008;44(10):512-518. ↑ Fischer MJ, Scharloo M, Abbink JJ, Thijs-Van A, Rudolphus A, Snoei L, et al. Participation and drop-out in pulmonary rehabilitation: a qualitative analysis of the patient's perspective. Clin Rehabil 2007 Mar;21(3):212-221. ↑ Strijbos JH, Postma DS, van Altena R, Gimeno F, Koeter GH. A comparison between an outpatient hospital-based pulmonary rehabilitation program and a home-care pulmonary rehabilitation program in patients with COPD. A follow-up of 18 months. Chest 1996 Feb;109(2):366-372. ↑ Zakrisson A, Engfeldt P, HÃ¤gglund D, Odencrants S, Hasselgren M, Arne M, et al. Nurse-led multidisciplinary programme for patients with COPD in primary health care: a controlled trial. Primary Care Respiratory Journal 2011 December;20(4):427-433. ↑ 33.0 33.1 33.2 33.3 Backley J, Bloom J, Bott J, Jones R, Langley C, Singh S, et al. A summary of recommendations of the pulmonary rehabilitation in the community- sharing best practice meeting. General Practice Airways Group 2005:30/10/12. ↑ 34.0 34.1 34.2 34.3 34.4 Nici L, Donner C, Wouters E, Zuwallack R, Ambrosino N, Bourbeau J, et al. American Thoracic Society/European Respiratory Society Statement on Pulmonary Rehabilitation. American Journal of Respiratory and Critical Care Medicine 2006 June 15;173(12):1390-1413. ↑ Liddell F, Webber J. Pulmonary rehabilitation for chronic obstructive pulmonary disease: a pilot study evaluating a once-weekly versus twice-weekly supervised programme. Physiotherapy 2010 3;96(1):68-74. ↑ Couser JI, Martinez FJ, Celli BR. Pulmonary rehabilitation that includes arm exercise reduces metabolic and ventilatory requirements for simple arm elevation. CHEST Journal 1993 January 1;103(1):37-41. ↑ Epstein SK, Celli BR, Martinez FJ, Couser JI, Roa J, Pollock M, et al. Arm training reduces the VO2 and VE cost of unsupported arm exercise and elevation in chronic obstructive pulmonary disease. J Cardiopulm Rehabil 1997 May-Jun;17(3):171-177. ↑ Keating A, Lee AL, Holland AE. Lack of perceived benefit and inadequate transport influence uptake and completion of pulmonary rehabilitation in people with chronic obstructive pulmonary disease: a qualitative study. Journal of Physiotherapy 2011 9;57(3):183-190. ↑ HM Treasury. UK budgets 2009-2012. 2012; Available at: http://www.hm-treasury.gov.uk/home.htm. Accessed September/18th, 2012. ↑ HM Treasury. UK budgets 1998-2008. 2008; Available at: http://webarchive.nationalarchives.gov.uk/+/http:/www.hm-treasury.gov.uk/budget/budget_04/bud_bud04_index.cfm. Accessed September/18th, 2012. ↑ About Inflation. UK Inflation Rate Historical chart. 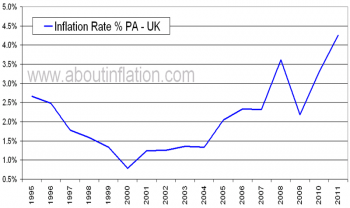 2011; Available at: http://www.aboutinflation.com/inflation-rate-historical/uk-inflation-rate-historical-chart. Accessed November/15th, 2012.